A Little Journal of Life. Batavia / New York, NY. Publisher: Grail Press. 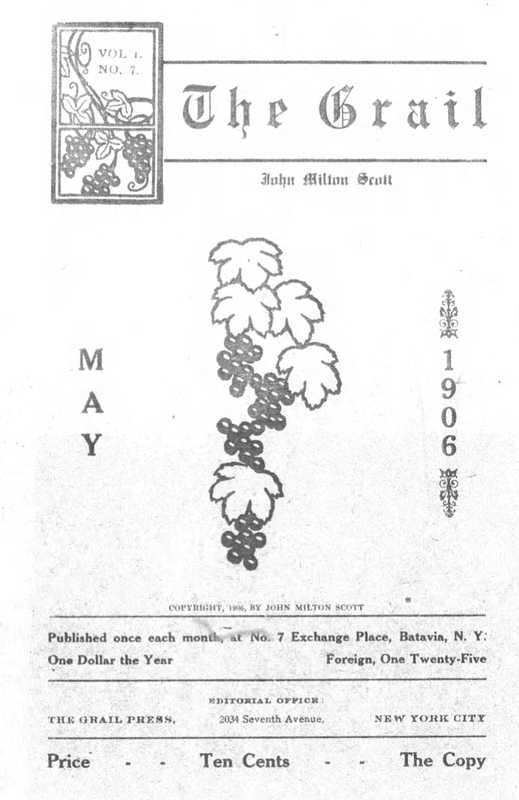 Editor: James Milton Scott. 1/1, November 1905. 38 pp., $1.00 a year. This contained Scott's lengthy, saccharin ramblings on life, God and reality, as well as samples of his rather literary and stylized poetry ("Be Puck with me and let us girdle the earth. Be Apollo, and let us shine into the sun"). The advertisement for the journal in Nautilus states simply: "Who will follow this quiet way of The Grail may learn how divine he is, how beautiful the lives of man, How unsurpassingly glorious the Creative Joy at work in the souls of the race." Scott later edited the New Thought News in Los Angeles. Noted in New Theology, September 1908. LOC; Harvard University; San Diego State University; USC; University of California, Santa Barbara.